The renderings for the North County Transit Center in Ferguson. Metro is building the North County Transit Center to make the public transit experience more comfortable for big chunk of its ridership. But Metro COO Ray Friem jokingly said his agency has an ulterior motive for the project. Indeed, Metro is transforming a former Mazda dealership in Ferguson into a centralized hub for its bus service. The agency officially broke ground Tuesday on the project, which is located on Pershall Road between West Florissant Avenue and New Halls Ferry Road. 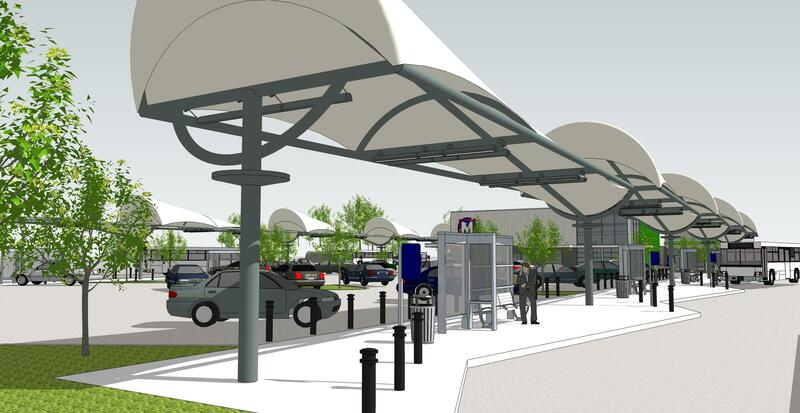 The transit center is slated to have 10 bus bays, concession stands and restrooms. It will also have a free parking lot and an indoor waiting area to protect passengers from bad weather. 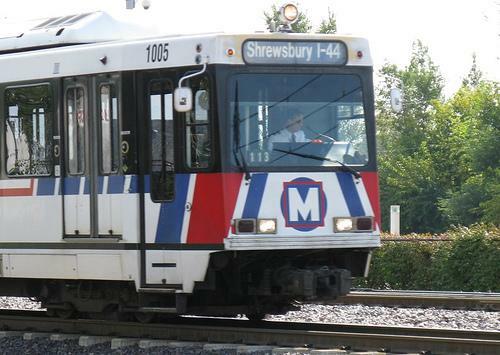 North St. Louis County makes up about 20 percent of Metro's bus and light rail ridership. Friem said the transit center will provide a quicker and more comfortable way for North County residents to commute. Metro President and CEO John Nations said the agency’s transit centers in St. Louis and St. Louis County move “a lot of people upon multiple bus lines to get to their destination in less time and with greater efficiency.” That, he said, helps people get to their destination more quickly and helps bus lines run more smoothly. “It also allows us to improve our efficiencies, which allows us to stretch the tax dollars even further in order to serve the riding public,” Nations said. Dignitaries celebrate the groundbreaking of the North County Transit Center. It's expected to open to the public next fall. Ferguson Mayor James Knowles said the center could be an economic development tool. He said it could incentivize businesses to sprout up around the transit center in order to serve passengers. For instance, Nations said he could see cleaners or grocery stores opening nearby. The transit center is expected to open to the public in the fall of 2015. Nations said his agency is seeking federal funds to build a maintenance center on an adjacent plot of land. That facility, Nations said, would house dozens of buses and Call-A-Ride vans which he said would make North County bus lines more efficient. The Number 70 Grand bus is Thelonda Malone’s primary source of transportation — besides her feet. Malone uses the Metro Transit's busiest bus route to get to and from work. She says it’s useful. But some aspects of the ride could use some improvement. For one thing: When Malone gets off work at 5:30 p.m., she says she has a “50 percent chance of even being able to get on the bus.” If Malone does catch that second bus, she usually has to stand. Jordan Wilson saw the No. 70 Grand Line’s capacity issues firsthand. The north St. Louis County resident is a regular rider on Metro’s buses. When he rode the Grand Boulevard line, it was filled to the brim. “I can see that it’s already packed, and the need is already there,” Wilson said. Metro showed off its refurbished, 60-foot, articulated buses on Friday. The buses represent the transit service’s response to overcrowding on the #70 Grand Line. Metro’s busiest route is often so crowded that riders have to stand – or can't even get on. 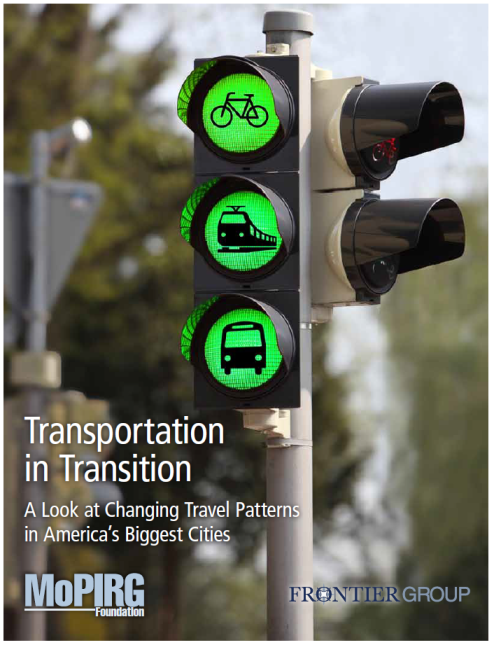 A new report suggests that Americans in urban areas are driving less. The analysis of the 100 largest urban areas in the country by the U.S. Public Interest Research Group found that since 2000, fewer commuters are using cars to get to work. And in most cities, the use of public transportation has gone up (since 2005), and more people are biking to work or working from home (since 2000). But, in St. Louis, the trend is less clear. Fewer workers are relying on cars, but the use of public transportation has also decreased. St. Louis Mayor Francis Slay announced a new program today that’s geared toward building low-income housing near MetroLink stations and MetroBus stops. The city will use $1 million from the Affordable Housing Trust Fund to spur development around public transit. St. Louis Mayor Francis Slay said easing transportation costs can help low-income residents move up the income ladder, giving them affordable access to things like jobs and education. Big picture, he said the idea falls under the city’s Sustainability Plan.